Participants in this week's Conductor Meeting: many have travelled a long way to compare notes on ITER conductor production. It's a tradition now. Twice a year, the ITER conductor family meets to review the status of strand production, cabling, and jacketing activities—all part of the global drive to produce state-of-the-art superconductors for ITER. 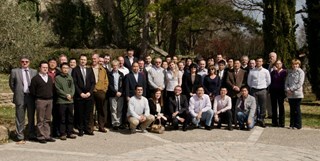 Fifty participants convened in Cadarache on 21-23 March to compare progress notes and discuss technical issues during regular and breakout sessions. "Production is rolling all over the world," began Arnaud Devred, leader of ITER's Superconductor Systems & Auxiliaries Section, in his presentation on the first day of the meeting. "We have produced nearly 300 tonnes of niobium-tin (Nb3Sn) superconducting strands, about two-thirds of the amount needed for ITER's toroidal field coils. I probably don't need to remind you that in the pre-ITER world, global production was 15 tonnes a year ..."
Getting to this point has not been easy. The ITER Organization has had to pioneer reporting, document handling and quality assurance procedures to ensure that strands produced by suppliers in China, Europe, Japan, Korea, Russia, and the US—the six ITER Members involved in conductor production—achieve the same required performances. The semi-annual Conductor Meetings provides the opportunity for representatives of the ITER Organization, Domestic Agencies, specialized laboratories, and industry to compare notes in person. The news on the production of toroidal field conductor is good: All Domestic Agencies are in full production, having qualified Nb3Sn strand suppliers through the successful testing of Conductor Performance Qualification Samples (CPQSs). The 100-tonne mark was passed in October 2010; this month, global production will pass 300 tonnes, or approximately 63,000 kilometres of total wire length. Cabling activities for the toroidal field conductor are underway in five Domestic Agencies. "We have about six-months of lead time in strand production with regard to cabling, which is very good news indeed," explains Devred. Twenty-eight regular double pancakes and twelve side double pancakes have been cabled worldwide. Five Domestic Agencies have competed welding qualification/certification and jacketing line commissioning. Three jacket tube suppliers have been qualified and all Domestic Agencies have placed contracts. Toroidal field strand production has increased steadily since 2009 and will soon pass 300 tonnes. "As we pass production milestones one after another, we are expecting a large number of conductor deliveries this year," says Devred. The Chinese and Russian Domestic Agencies are also in production mode for the niobium-titanium (Nb-Ti) strands for ITER's poloidal field conductor. 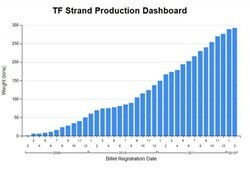 Russia has entered nearly 50 tonnes of strand production into the Conductor Database and has delivered all Phase II cable unit lengths to Criotec (Italy) for jacketing. China has completed poloidal field tube and welding qualification and has manufactured an 800-metre copper dummy for testing. An update was also given on the central solenoid conductor. Qualification activities continue to validate design choices and potential suppliers. The qualification tests are carried out on full-size conductor samples at the SULTAN test facility in Switzerland. To facilitate operation and ensure the suitable funding of SULTAN for ITER needs, the six conductor Domestic Agencies and the ITER Organization have agreed on a global SULTAN contract that will be handled by the ITER Organization. This first-of-a-kind contract may serve as a model on how the Domestic Agencies and the ITER Organization can join forces and create synergies for critical quality control steps. "Conductor production is well underway in all Domestic Agencies and for all Procurement Arrangements," summed up Devred. "This year we are switching from the process qualification phase to real production. We need to maintain momentum to meet ambitious goals for delivery."